It's rocking a 3.5-inch ClearBack display, complete with toughened glass adn nHD resolution (640 x 360). 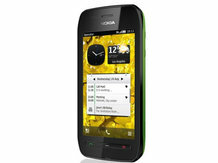 Nokia 603 is a Symbian Belle OS (Now Belle OS) based smartphone. It is a 3G enabled and comes with 5 MP camera & 3.5 inch screen display. It's other features also nice. I can say it's a nice phone at affordable price.